My name is Brittany Spillman and I am a teacher at Lee-Scott Academy in Auburn, Alabama. I’ve always been an Auburn fan and I enjoyed watching Philip play for the Tigers. Though I did not know him personally, I felt that he embodied everything it meant to be an Auburn man. I, like many others, was heartbroken when I heard of his passing. I prayed alcohol wasn’t involved because I thought it might tarnish everything he stood for and that was all he would be remembered for, not for his integrity, respect and character that he demonstrated on and off the field. When I heard Mr. Lutzenkirchen started the Lutzie 43 Foundation, I quickly followed them on social media. As a teacher, I am always looking for a way to prepare my students for the world outside our school walls. I strive to educate the whole student, mind, body and soul. I began seeing posts from the Lutzie 43 Foundation about a character development curriculum for coaches and schools. I did not hesitate to order a book as soon as it was available and tried to figure out a way to incorporate it into my curriculum. During the 2016-2017 school year, I was asked to teach an ACT Prep class for juniors. I was given this wonderful opportunity to teach a grade and subject that I do not normally teach and thought this would be a wonderful way to break up our ACT Prep lessons. On Wednesdays, which became known as Lutzie Wednesday’s, we would read three to four lessons during our fifty-minute period. We read the lessons together, discussed how it related to their lives, watched videos on YouTube about Philip or the author of the story, and they completed the player application. Since I teach at Lee-Scott Academy, a private, Christian, college preparatory school, I could take full advantage of the Bible verses at the end of the lessons. I believe they really add to the lessons and tie everything together. When we finished the curriculum, I invited my students to apply for the PFL Character Scholarship. I had many students apply and one was chosen to receive the $4,300 scholarship, KK Dubberley. I was invited to attend the scholarship dinner with KK and our headmaster, Stan Cox, at Pursell Farms in Sylacauga, Alabama. When KK gave her speech, there was not a dry eye in the room. The Lutzenkirchen’s have embraced KK and made her feel like family. I believe in the curriculum and I think it is exactly what high school students need to hear as they begin to head off to college. As a result, and with the support of my administrators, I created a new class for the 2017-2018 school year based on the curriculum. The “My Character Counts” class consists of 11 seniors. We study the 43 Lessons to Legacy curriculum, do a book study of The Purpose Driven Life, have a mentoring program for our elementary students and take part in community service projects. I chose to supplement the 43 Lessons to Legacy curriculum with these things because I feel like they all tie back to the curriculum and the words and actions that Philip embodied. In February of 2018, Mike Lutzenkirchen was our speaker for Spiritual Emphasis week. After he spoke to our high school students about Philip’s Legacy…What Legacy Are You Leaving?, he came back to my room and spent forty-five minutes speaking to the seniors in my Character Counts class that just finished the 43 Lessons to Legacy curriculum. 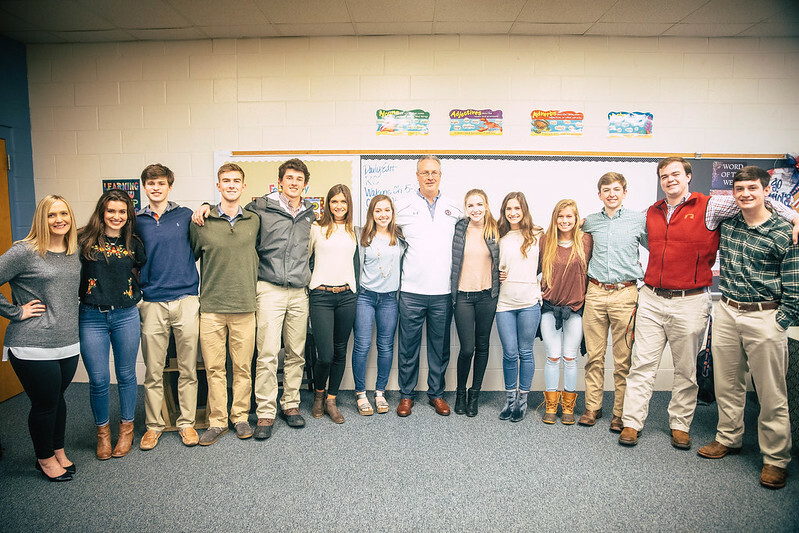 The Lutzie 43 Foundation has made it their mission to spread Philip’s legacy and encourage students to be great friends instead of good friends. They have greatly made an impact on the students at Lee-Scott Academy.